Experience with switch to BT! You have to have some sympathy for the people who work in the BT complaints department in India. You get to listen to annoyed people like me complain all day long so not a pleasant jobs and a thick skin required. So I take my hat off to them whilst being annoyed at the overall service. 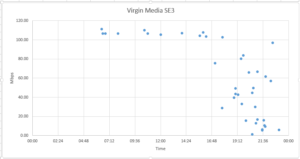 I finally made the decision to switch from Virgin after the latest increase to £35/pcm when my “special deal” ran out plus the fact that there is a terrible dip in bandwidth in the evening – I’ve been collecting stats for months. The other attractive offer from BT was a new line included when you ordered BT Infinity which gave me the opportunity to move the master socket to the middle of the house – a much better place for Wifi than the corner of the lounge. So, it starts well when an support person calls and says she will be in charge of everything (I don’t think I heard from her again). An engineer visits and checks that the current service cannot support another line for broadband so we agree the only option is to lay a new cable from the street to the corner of the house – the cable from there to a new master socket is installed. Now I am waiting for contractors to arrive and dig up the drive for the new cable and things start to go wrong – a succession of engineers arrive to contradict the first engineer and by the third visit (about three weeks later) convince me that they would rather disconnect the current land-line and use it for the broadband (and new number). To be fair, I was going to disconnect the original line when the broadband was up and running so the expense and hassle of digging up the drive was not strictly necessary. However, it did mean that my home number of 15 years was cut off and I had to be organised to get an order to move that number to the new line. Luckily that happened ok so I got my original number back. So now BT Infinity is up and running and it’s working pretty well, reliable 70-80Mbps download and 16Mbps upload (much better than Virgin). A hassle to re-number all the static devices and some undesirable quirks of the smart hub e.g. not being able to turn off SID broadcast. The next problem appears – cannot log in to BT mail. I configured an address which the website told me would be available to use in 30 minutes but something went wrong. BT mail disappeared from “My Extras” and could not log in. A succession of 2nd line support people called me and some even called me after 22:30 when I was falling asleep which really annoyed me. I registered my displeasure at the complaints site so someone else started calling me. The lack of mail was particularly irksome as to be able to send mail, MacMail has to be configured with an SMTP server and I could not connect to a BT SMTP server without the email account. I had to keep the Virgin service running to send mail. The mail issue was eventually fixed at the end of October by the back office after ordering at the end of August. BT offered me £5 by way of goodwill, which just annoyed me even more. Mail is “free” you see so not worth anything in BT’s world. Having done all that I called Virgin to cancel my service and close my account. Now I have customer services calling me to persuade me to stay. They offer me 150Mbps and £15/pcm! Big difference from £35! But too late and that won’t solve the performance problem. Now it’s all configured and running, it seems good – but time will tell. Having the competition / choice is nice. This entry was posted in General Technology and tagged BT Infinity by Duncan Baillie. Bookmark the permalink.